Mission unveils M-Cubed surround sound speaker package | What Hi-Fi? 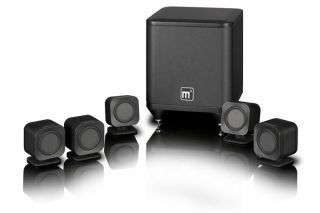 Mission has announced the launch of its new M-Cubed (M3) surround sound speaker package, which the manufacturer is hoping can build on the success of its predecessor – the M-Cube. In our review of the M-Cube, we described it as a "formidable cinema system" and handed it the full five stars. No surprises, therefore, to say we're keen to see if the M-Cubed can continue that form. The M-Cubed package comes with five small satellite speakers – all of which are believed to be small enough to fit into the palm of a hand - in addition to the powerful subwoofer. A 20cm long-throw driver is used in the M-Cubed's subwoofer, which Mission says will work in conjunction with the speaker quintet to create a "seamless sound field" for both films and music. Balanced Mode Radiator (BMR) technology has also been used by Mission, which it says is the "key to the system's ability to deliver high quality sound" no matter where you are in the room. The BMR drivers distribute the sound over a 90-degree angle and can handle a full range signal – this means the speakers connect directly to an AV amp, letting you place the sub wherever. Peter Comeau, director of acoustic design at Mission's parent company IAG, said: "We always wanted M-Cube to be small and discrete yet pack a bigger acoustic punch than you could ever imagine from speakers this small. "For M3 [M-Cubed] we’ve really upped the standard thanks to years of development on our own BMR driver. M3 delivers such an enjoyable and believable movie experience in such a versatile package." You can now buy the Mission M-Cubed for £700, with the UK range launching with an all-black finish. An all-white finish will follow later. Individual speakers can also be bought and used as part of a Dolby Atmos set-up.